27-year-old Sainy Banerjee from Delhi is a woman of many shades. "I am a trained Bharatnatyam dancer and a Hindustani classical singer. Being a Bong, singing was a part of my life from the time I started to speak maybe. I remember, as soon as it would be 7 in the evening, I used to be dragged back home by my father from my evening's play with the kids in the neighbourhood. He would then order me to freshen up and start the riyaz with the harmonium. Which is why, Singing was one thing that I hated the most in my life, but today I really wonder how I fell for it. Dancing and painting have always been my favourites and I try to take time out for them whenever possible, but the latest passion that I religiously follow these days is bugging my better half. When he makes those faces on my worst PJs, is what I thoroughly enjoy!” she laughs. A senior software engineer with a Digital Product Engineering Services MNC, Sainy moonlights as a writer. And she blends both her worlds together beautifully. But a huge surprise was when one of her stories was recently published in an anthology book named Kaleidoscope. "A few months back, I had participated in an all India story-writing competition where much to my surprise, I was selected in the top 15 writers! Tracing back how it all started. One day when I was in the office, trying to debug a piece of code, I thought of taking a break for a while. While I was having tea at the pantry area and checking my personal mailbox, I saw this mail about a story-writing competition organized by Yes Bank in association with a publishing house, StoryMirror. I promptly checked the terms and conditions and started drafting a story that was in my mind since my engineering days. The story was inspired by a dream that I had once while I was in my 3rd year of engineering. Our college and the hostel was situated very far from the main city of Pune and had nature's best views to offer. At day time it would be splendid but during the night time, it would be somewhat scary. There are numerous episodes, both good and bad, that remain fresh in my memory, but the one narrated in the story was the most terrifying one. I completed writing the story in an hour or so and submitted it.” she narrates. At the time of submission, Sainy didn’t expect much. But about 4 months later, she got another email telling her that her story was chosen to be published in an anthology. I feel an achievement of this kind can make someone feel over the moon. And I ask her as much. This doesn't mean at all that things have come easily to Sainy. In fact, she had to learn to deal with loss at a very young age. "I was barely 3 or 4 when my elder sister died. She had a very weak immune system right from birth along with a couple of severe health issues. I have faint memories of her from the time when I had just started to understand the world. I remember one happy family, playing and laughing together. But after my sister's death, there was a void which was very difficult to fill. As a child, I remember I had no one to play with. So I used to go to play with other kids in society. They used to play with their siblings. When I grew a bit older, I remember my mother crying most of the time, all alone looking at my sister’s photo. Dad used to keep himself completely occupied with work, to avoid the grief. I could not see my once very happy parents so gloomy and sad. Being too young at that point in time that I knew I had to do something, but could not." The little girl she was, she still decided to take matters in her own hands anyway. "One day at school, I heard few girls saying that children who die, go to the well behind our house. This was like a ray of hope for me! So one day, I decided to search the well. My hopes were high that I would find my sister there. I was barely 8 or 9 years old then, who had never been outside the colony alone. I found out the well, but it looked too deep. I was so crazy about finding my sister there that I did not mind going in. I was delighted to see the stairs in the well. As soon as I started to climb down the wall of the well, I heard my mother with some aunties screaming from my back. You can imagine the music I must have faced then! My parents scolded me but when I told them my intention they broke into tears." she reminisces. "My parents told me that relatives and many family friends suggested them to bring me a younger sibling or try for a son But they refrained. Simply saying that they were more than happy with me. I was all they needed." she smiles. I was always a very soft-spoken person. When I was in school and later college, people used to make fun of my speaking style. I never replied back to them. I never understood why they used to have problems with me, while I was so gentle toward all. At that point, I thought about the saying "As in Rome do as the Romans do". And I tried to talk harsh and tried to be like the people who used to taunt me. But that never worked well for me. I hated myself and gradually understood that, if I am speaking softly doesn't mean I am soft by heart too. I learned how to give it back to the people, as and when it was required. This way I succeeded to maintain my individuality along with my dignity. Tough times have been there in my life. And I guess they should be in everyone's life, otherwise, how would you be happy when the tough times pass. From failures to betrayals and from accidents to depression, I have faced it all. But a small incident in my hostel has made me realize that I can very well handle haters and criticism. When I was away from my hometown in Pune and was pursuing engineering, there was a time in the first year when I had a tough time with few girls in the hostel. On one hand they used to make me feel like they were my besties, and on the other hand, used to gossip all sort of ugly things about me behind my back. When you are in your early 20s backbiting from your girlfriends has a negative impact. When I found out, my trust was shattered. This affected my studies to an extent. But something kept telling me from within that life must go on and this is just a part of life. I broke all the contacts with those girls and started to focus on my well being. Initially, it was tough but when I was over them, I realized it was nothing. For some very good deeds in my past lives may be, I have been blessed with a very loving and supportive family. My parents, in-laws and my better half, all equally love me. The love and care that I see in their eyes are all that keeps me going. Her mantra for living life is just as inspiring. Bargain more with the overpriced items sold in malls, than with the poor vegetable sellers at the mandi. And I continue to be awestruck by how such beautiful and badass goddesses live in the world around us, every day. How I Convinced My Parents For Love Marriage! Where Does A Woman Stand Between A Lifestyle Change & In-Laws? 6 Essentials Of A Bengali Bride's Perfect Marriage Get-up! 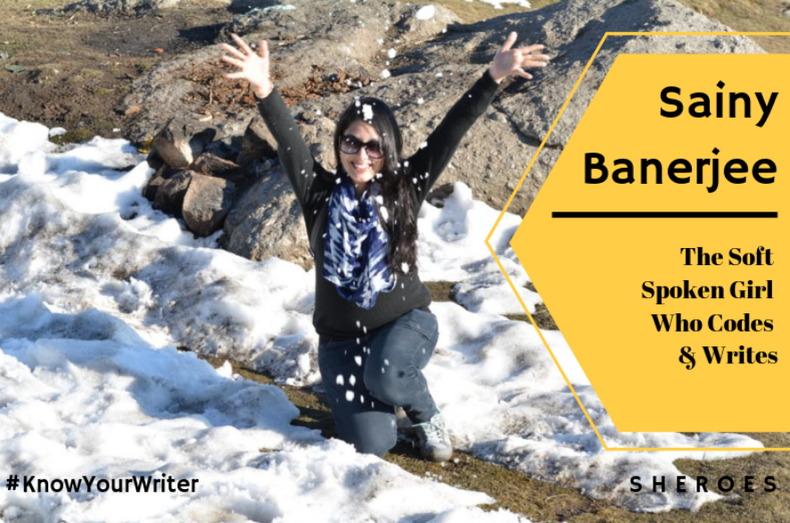 Know Your Writer is our attempt to shine the spotlight at our writers who bring you amazing and inspiring stories of women and helpful tips and life hacks via their articles on SHEROES. We thought, why not celebrate these SHEROES who make a difference with nothing but a pen in their hands. Stay tuned to #KnowYourWriter!